ABUJA, NIGERIA (ANS – August 4, 2016) — The disputed leader of Boko Haram has said he is still in charge of Nigeria’s militant Islamist group despite a statement by so-called Islamic State (IS), also known as ISIS, that he had been replaced. 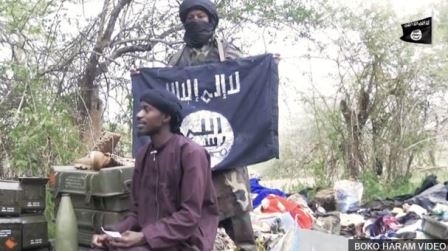 “Shekau accused al-Barnawi of trying to stage a coup against him,” said the BBC. Boko Haram is fighting to overthrow Nigeria’s government and establish an Islamic State in the north, the region of the country where I was born to British missionary parents. In the last 18 months it has lost most of the territory it had controlled after being pushed back by an offensive by the forces of Nigeria and its neighbors. Boko Haram had particularly been targeting Christians, church, and schoolchildren in its barbaric campaign of terror. The BBC went on to say that Shekau was last heard from in an audio message last August, saying he was alive and had not been replaced – an IS video released in April said the same. “I was asked to send my ideology in writing to the caliph but it was manipulated by some people in order to achieve their own selfish interests,” he added, describing a coup attempt against him. Nasidi Yahaya of BBC Africa, based in Abuja, said: “Boko Haram has split before but this is the most serious division to date. Abubakar Shekau’s outburst clearly shows that there are deep disagreements, which could translate into clashes between the foot soldiers loyal to the two leaders. “It is also a sign of the weakness of the group, possibly foreshadowing an eventual collapse. “Military officials say the split is an indication that the group is breathing its last. The BBC’s Abuja bureau editor Naziru Mikailu says this split is likely to have a major impact on the way the group operates and could be a turning point in the fight against the insurgents. Shekau took over as the group’s leader after its founder, Muhammad Yusuf, died in Nigerian police custody in July 2009. In numerous videos, Shekau taunted the Nigerian authorities, celebrating the group’s violent acts, including the abduction of the more than 200 Chibok schoolgirls in April 2014. Nigeria’s army has claimed to have killed him on several occasions, and he has not appeared in a video since Boko Haram aligned itself with IS. Note: Having been born in Nigeria, I am hoping and praying that we will soon see the complete collapse of this vicious terror group that has been causing so much havoc in the land of my birth. * Polytheism, the belief in many gods. Polytheism characterizes virtually all religions other than Judaism, Christianity, and Islam, which share a common tradition of monotheism, the belief in one God. (https://www.britannica.com/topic/polytheism). Photo captions: 1) Boko Haram troops in training. 2) Some of the missing Chibok schoolgirls. 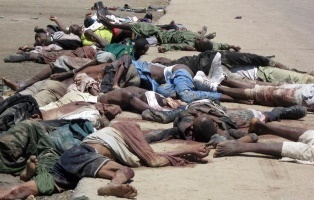 3) Boko Haram victims. 4) Dan Wooding pictured shortly after his birth with his mother, Anne Wooding, at Vom Christian Hospital, Nigeria. 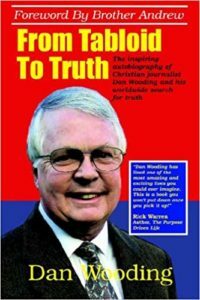 About the writer: Dan Wooding, 75, is an award-winning winning author, broadcaster and journalist who was born in Nigeria of British missionary parents, Alfred and Anne Wooding, who then worked with the Sudan Interior Mission, now known as SIM. He now lives in Southern California with his wife Norma, to whom he has been married for some 53 years. They have two sons, Andrew and Peter, and six grandchildren who all live in the UK. Dan is the founder and international director of the ASSIST (Aid to Special Saints in Strategic Times) and the ASSIST News Service (ANS), and is also the author of some 45 books. He also has one weekly radio show and two TV shows all based in Southern California.